I have been approached by Sport Diver Magazine to do a series of photocentric features for them. The first piece was on Raja Ampat, in Indonesia, and appeared last month. This most recently published piece is on diving in Thailand – the Similans, Surins, Koh Bon, Koh Tachai and Richelieu Rock. I will be doing a future bit on diving around Phi Phi, Anemone Rock and Shark Point – too many wonderful sites to cover in one article. This entry was posted in All About Scuba Diving, Image Galleries, Sport Diver Magazine Photo Essays and tagged Sport Diver Magazine, Thailand Diving. Bookmark the permalink. Could you tell me exactly where to see the mantas and schooling barracuda in Thailand? Exactly what city and dive location/dive resort? A guy told me the very best place he ever dove in Asia was Komodo Island, where the Komodo dragons are. Do you have an opinion on this? I do like seeing the big animals or schooling fish. Let me know. Thanks. Hello Rick. The mantas were at Koh Bon in Thailand. 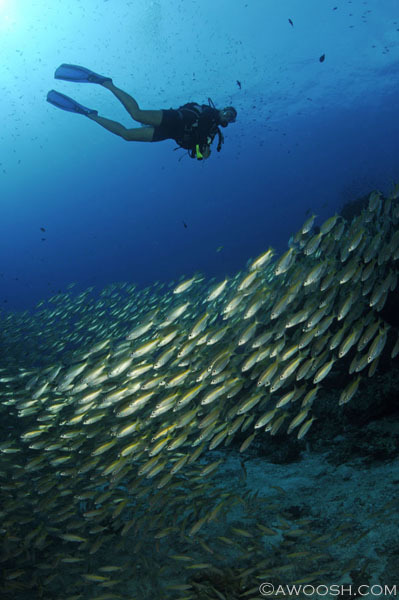 There are day operators out of Phuket that can take you there, but the better choice is to dive this area from a live aboard boat. I really like The Junk – have gone with them three times, and would go back. Not super expensive, but excellent crew, great food, safe dive ops, comfortable cabins. Some of the live aboards are truly cattle boats, dumping too many divers at once on the sites. Komodo is right up there with my favourite diving in the world that I have done. Very colourful and lively reefs, a lot of fish, not overly populated by boats or people. There are many live aboard boats that do the Komodo itinerary (it is a seasonal destination) – depending on your budget you can go super luxe to quite inexpensive. The Grand Komodo boats aren’t fancy, but I think they run a good op. You can day trip to Komodo from land-based operations in Flores, but like Thailand, the best way to do this diving is from live aboard. Also beware the cattle boats that have too many divers on board. No more than 18 would be recommendation.